One of the greatest insight I got from Charlie Munger was about Mental Models. 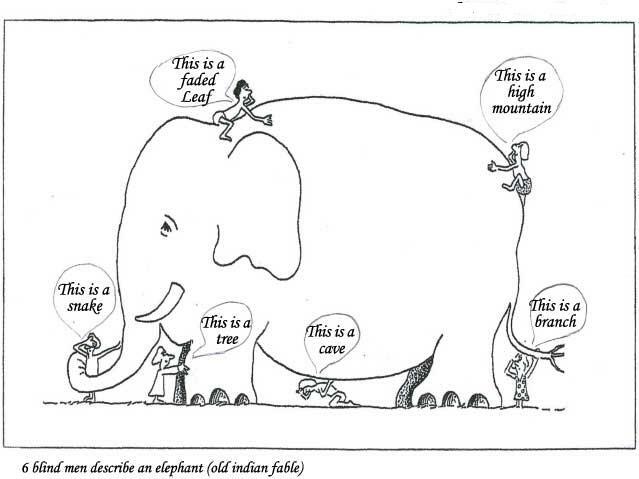 You may remember the old Indian story about the blind men and the Elephant. Each of the blind man had different opinion on how the elephant look like. When we see reality , it is only a part- based on our little knowledge and experience. Hence, we need to have all the big ideas (models) from each discipline to understand the Whole , the truth. The truth what we understand is only approximation. So beware of our tendency of consistency and commitment which makes us to favor status quo. We need to change our perspective/opinion based on the facts if our opinion doesn’t match the facts. We cannot fool the reality. However, the tendency of Self-denial keeps us fool- we rationalize our decisions which are based on emotions rather than facts and selectively choose facts to justify that…. I have been like that and all human tends to do so. As per Charlie, you’ve got to have models in your head. And you’ve got to array your experience- both vicarious and direct- on this latticework of models. You’ve got to hang experience on a latticework of models in your head. Unveil the ignorance by watching these insightful and thoughtful speeches and then putting into practice. What I admire about Charlie is that he is rational. He has this great ability to learn continuously and then relate these models to common life’s problem. In the psychology of human misjudgment, Charlie discusses 25 tendencies which are useful and often mislead. From reward/punishment to Lollapalooza , he discuss them with reference to business problem. While addressing USC Gould School of Law Commencement address, he offers insights into the practices that has contributed to his success and making him one of the wealthiest people in the world. It is in five parts. Absorb them and spread the word of Wisdom. this post/video will focus one aspect of this.